City of Ghosts and Dolores are two unforgettable documentaries I saw at the Dallas International Film Festival this month. Many in the audience seemed equally stunned: how come I didn’t I know about these people? Most of us know that Raqqa, Syria, is the self-proclaimed headquarters of ISIS. That one thought–that horrific image of masked terrorists, black flags waving, riding around in tanks and brandishing automatic weapons and blood-encrusted swords–is dire enough to shut down and obliterate all other thoughts, even something as simple as wondering–what was Raqqa like before? City of Ghosts answers that question and takes us on a harrowing journey. It’s the story about a group of young people–university pals, mostly–who decided to take on the role of civilian journalists. By keeping the world informed about the atrocities committed inside Raqqa, they’re fighting an epic battle with words and pictures instead of guns and swords, hoping against hope to reclaim the city they love. Raqqa was once a cosmopolitan city. It sits on the NE bank of the Euphrates River, and the film shows us what Raqqa looked like before all the fighting started. Handsome buildings, happy-looking people, and a river that flowed blue-green water. One young man in the film describes city life back then: if your neighbor was happy, you were happy. Wedding celebrations went on for days. There were female doctors, teachers and lawyers. There were also mixed marriages and mixed cafes, bars and restaurants. But many people there–and in other parts of Syria–wanted independence from the harsh Assad regime. When the Arab Spring began in Tunisia in 2011 and spread to Egypt and beyond, a small group of Raqqa university students began reporting on a growing anti-Assad movement in 2012, spreading the news via cell phones and computers. They gained a following, which continued when Civil War broke out in response to Assad’s crackdown on demonstrators–killings, torture and imprisonment. By March 2013, rebels inside Raqqa led by the Free Syrian Army (officers who defected from Assad’s armed forces) seized the central square and knocked down the statue of Assad’s father, former president Hafez al-Assad. For seven months, Raqqa was a liberated city where people could speak their opinions freely. Raqqa became the “hotel of the revolution,” a city that swelled with refugees from other embattled Syrian cities. Then ISIS showed up. The students kept the news flowing, even then, but things turned pitch black very fast. The Free Syrian Army was busy elsewhere in Syria. ISIS took over the government buildings. They executed Assad supporters and others, destroyed mosques that weren’t Sunni, and destroyed the Christian churches. Then they took over the entire city early in 2014. Women lost all their rights. No one was allowed to speak to Western journalists or leave the city without permission. Beheadings were common, the heads placed on fence posts around the square to serve as a warning. The civilian journalists were forced underground, soon to emerge as the group known as RBSS: Raqqa is Being Slaughtered Silently. The film opens with RBSS members receiving a standing ovation in New York City, where journalists from around the world were gathered for the International Press Freedom Awards banquet. Until that moment, I didn’t know about RBSS. It seems inconceivable now. Are there any western journalists in Raqqa? Pretty unlikely. Without RBSS, how would we know what ISIS is up to? Not long after their arrival in Raqqa, ISIS called for the killing of RBSS founders. The first was caught and executed in May 2014. Afterwards the group met to discuss whether they should stop. In the end, they decided their lives were not more important than the life of their dead friend. Many fled to Turkey and later some to Germany, where they continue to work from “safe houses.” Using cell phones, they collect reports and video from the few members remaining in Raqqa, as well as other citizens willing to help. This information is posted on social media and disseminated to worldwide news organizations. The film shows one of the young journalists watching a video over and over at the safe house in Turkey. Seeing ISIS execute his father to retaliate against him keeps him motivated, he says. Since watching the documentary, I’ve read articles on RBSS in The New Yorker, Aljazeera, The Guardian (U.K.) and other publications. But if you didn’t happen to be reading that newspaper or magazine on a particular day, you might be clueless about RBSS–as I was. 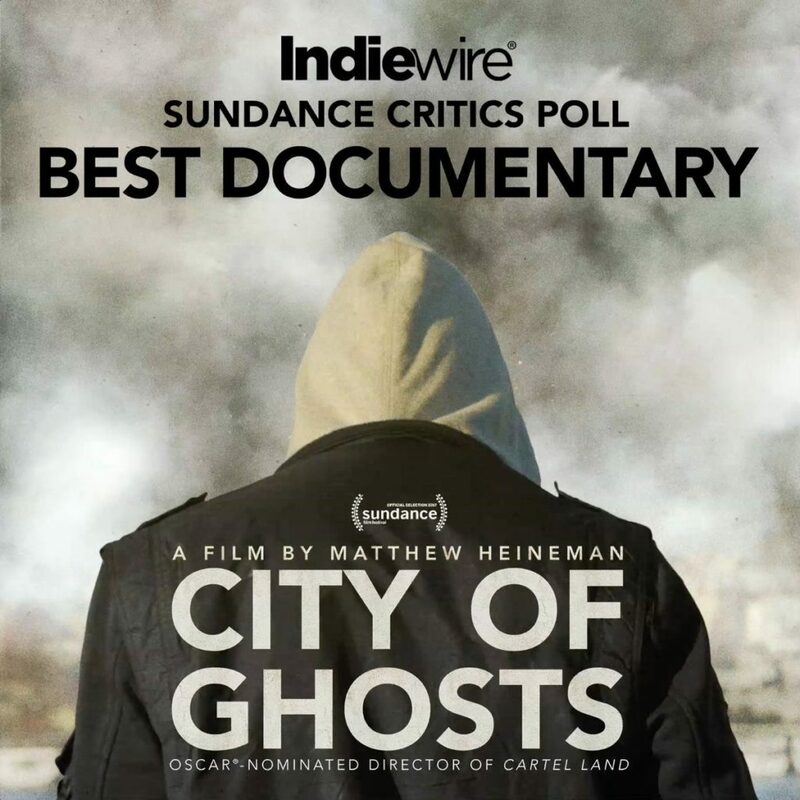 City of Ghosts premiered at Sundance this year and was bought by Amazon, which means it has a chance at wide distribution. With Syria much in the news these days, I highly recommend it. 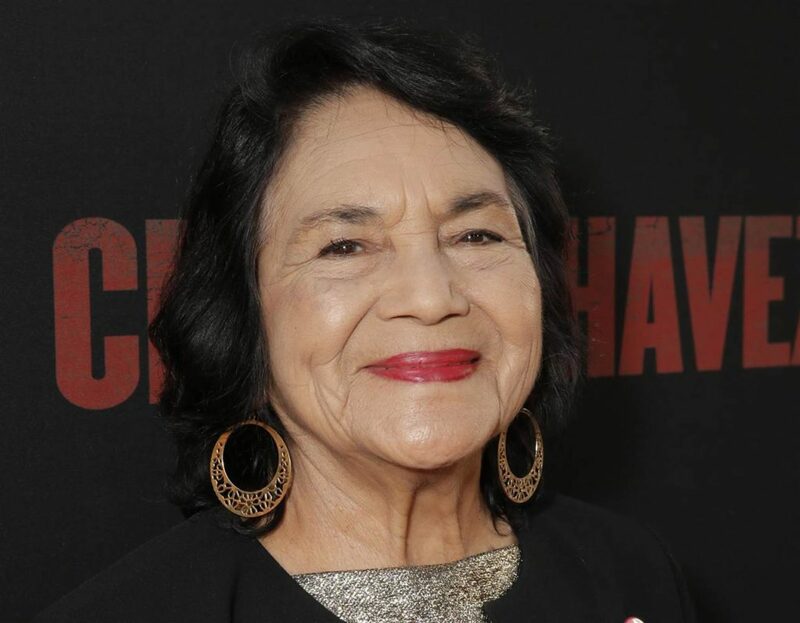 The documentary Dolores is about Dolores Huerta. Who? The well-dressed Latino man behind me didn’t know about her. Nor did the white man in front of me, a political consultant who’s run presidential and gubernatorial campaigns for the last thirty years. If Dolores had grown up to be a singer, she’d have become a one-name pop star like Beyoncé, Adele or Madonna. As things turned out, it took a two-name music icon–Carlos Santana–to make a film about her. It was his idea, and he executive-produced the movie. Dolores was born in New Mexico to parents who divorced when she was three. She loved music and dreamed of growing up to be a dancer. Instead she had 11 children. ELEVEN!!! To me that’s remarkable–astounding!–but that’s the least remarkable thing about Dolores Huerta. Dolores went to college and became a teacher. This was in Stockton, California. Many of her students showed up with empty stomachs and bare feet. She quit teaching because she thought she could do more by organizing farm workers than by trying to teach their hungry children. Everyone knows the name Cesar Chavez. What many people don’t know is that Dolores and Cesar co-created the United Farm Workers organization. TOGETHER. Three years later, in 1965, she and Cesar helped organize a nationwide boycott of abusive grape growers by convincing people to buy wine only if it had a union label. By 1970, grape growers had agreed to contracts which unionized most of the industry. Because of Dolores, farm workers finally had access to some basics like toilets and clean drinking water. Some of Dolores’s children are interviewed in the film. They do talk about life being hard growing up–a busy mother who wasn’t around much, who left them with other families or dragged them from place to place–but they obviously admire her and have followed her lead by choosing professions like doctor, nurse, lawyer and activist. Dolores has received countless awards, including the Presidential Medal of Freedom awarded to her by President Obama in 2011. At the ceremony, he said, “Dolores was very gracious when I told her I had stolen her slogan, “Si, se puede.’ Yes, we can. Knowing her, I’m pleased she let me off easy, because Dolores does not play.” In the early years of the United Farm Workers movement, Latino leaders would often tell Dolores and Cesar the government was too powerful and farm workers would never receive better working conditions. On one occasion, Dolores responded in Spanish, “Yes, it can be done,” and that became their rallying cry. “It’s not just the history of the farm workers’ movement. It’s the history of our United States of America. . . And so a women’s place in history has never been given the attention that it needs to be given, and that’s why we have a lot of the misogyny in our society today.” Dolores Huerta, NPR interview in January. One of the greatest treats of a film festival is that the filmmakers and stars often come and take Q&As after the showing. Dolores was there. At 86 she had no trouble walking down the stairs to the stage. She’s still busy working and talked about her own foundation, which she started with a Puffin Foundation Award of $100,000. In closing, she led the audience with a rallying cry: Who’s got the power? We’ve got the power! How do we get the power? By getting out to vote!